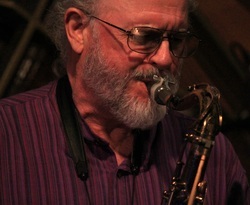 Born on May 22, 1941 in New Bedford, MA, saxophonist Duncan Martin has been playing jazz in the New England area for fifty years. He first performed at age thirteen in an eight piece dance band, "The Stardusters," at the New Bedford Yacht Club, earning $10! At Phillips Exeter Academy, Duncan became the lead alto player and coleader of the Royal Exonians, a dance band which performed at in- school and exchange concerts. During his four years at Exeter, he formed the Cubalibra Quartet with his friend, Carl Chase. The band's music was saved on vinyl by Vogt Recording Studio, Wellesley, MA, in 1960. While attending Boston University, Duncan played lead alto in the Gary Berger Big Band, a college organization based at Harvard. At the Berklee College of Music he studied woodwinds with Joe Viola. During those years, Duncan formed the "Duncan Martin Quintet" and began playing commercial gigs. After graduating from Berklee in 1969, Duncan taught instrumental music at the Elementary and Jr. High Schools in Westborough, MA. for eleven years. He built the concert band from thirty to ninety players in the 400 student Jr. High School, and established a sixteen piece big band. He was also an adjudicator for the Mass. Central District and All State competitions. Duncan continued to lead the Duncan Martin Quintet as well as his funk band, "Sambar" while helping to bring up four children, one of whom is a drummer. He has been teaching saxophone, flute, clarinet, and recorder as well as theory and jazz ensembles at the John Payne Music Center since l980. He is the conductor and arranger for the John Payne Saxophone Choir whose performances include five TV appearances, locally. The Choir has performed at Ryles Jazz Club, the Tam O' Shanter, the Regattabar, Sculler's and many other New England venues. In 1992, Duncan conducted the Sax Choir featuring presidential candidate, Bill Clinton, on tenor sax. In 1994, the choir performed for the president at a fund raiser for Ted Kennedy. They also opened for Livingston Taylor and Aretha Franklin at Boston venues. From 1990 - 2005, Duncan taught youth jazz ensembles at the Harvey Finstein School of Music, designing arrangements for various levels of proficiency. He also became Director of the program in 1993 until his retirement in 2005. On many occasions, Duncan has been invited to perform with the "Atlantic Clarion Steel Band," based in Brooksville, ME. led by his lifelong friend from Exeter days, Carl Chase, pan king of Maine! Carl and Duncan are collaborating on the title tune from Duncan's new CD project, "Song for Sandy." Duncan performed and recorded with the septet, "What's New Jazz Ensemble," founded by Bob Keough and Mike Morangelli from 1995 - 2005. The ensemble was a platform for original compositions. For the last 11 years, Duncan has played with the Shimon Ben-Shir Group," a quintet featuring their original compositions. The band has played live on radio, WERS, First Night/Boston, and performs all over New England. Its repertoire also includes Duncan's arrangements of many great jazz artists. He is currently semi-retired, but still teaching about 12 students each week and my adult jazz ensemble, The Sharp Nines. Duncan released CD, "Song For Sandy" in 2014, the first one under his own name.